Do you know why people quit a job they like? 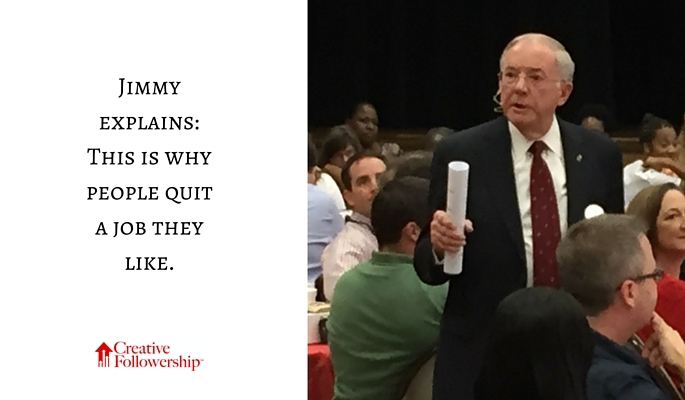 Do you know why people leave a company or organization they like? My wife and I were on the way to Nashville, where I would speak to a large audience of Chick-fil-A restaurant employees. 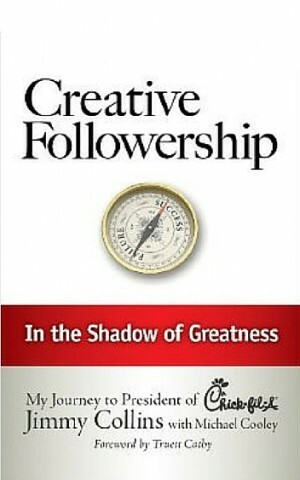 It was the day I would announce the release of my first book, Creative Followership: In the Shadow of Greatness. We stopped for lunch at Beau Noblitt’s Chick-fil-A restaurant in Murfreesboro. As I expected, he was already in Nashville preparing for the big event. As we sat down at a table, a smiling, friendly young man approached and asked if there was anything he could do to make our meal more enjoyable. I will call him Todd. Todd was very courteous and helpful. I was impressed! 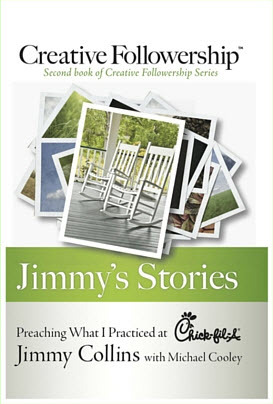 Todd had put into practice the first Principle of Creative Followership. to escape a bad boss! People don’t quit companies, they quit bad bosses. Think about what a loss it was to that other chain restaurant where Todd had quit because of a bad boss. I wonder how many other good employees quit because of that bad boss. In my experience, the most common cause of a high rate of employee turnover is a bad boss. There may be times in your career when you find yourself reporting to a bad boss. There are bad bosses, go-nowhere bosses and incompetent bosses in even the best organizations. If you like your company and your coworkers, try transferring to a good boss. Workers with good performance and pleasant personalities don’t usually find it difficult to transfer. In most organizations, bosses are constantly looking for high performance workers to add to their staff. If you cannot find a good boss within your company or organization, remember, the whole world is open to you. You are free to leave. It is your career, your future, and your life that is at stake. Take control and direct your career where you want it to go. If you are not satisfied with your boss do something about it. in reverse order of course! The stories I tell are true and from my real-life experiences. I never use actual names without permission. Where appropriate, names have been changed to protect individual privacy. I have left a job three times in my 20+ year career. Each time it was for exactly this reason. Brandon, that was also my experience. you right.. I’m a leader and I represent my company I stay focus And really busy times I get my hands dirty as the employees I’ve been working for same company for 14. years and my Corporation is one of the best out there I have seen many of those bad bosses Leaving left and right But I also have see good bosses leaving And not a good bosses replacing them. Yes, even the best organization usually have some bad bosses. I took on extra hours, a paycut, and a benefit cut to run like crazy from a pair of bosses recently. I now drink a lot less and sleep a lot better. Life’s too short. Change your attitude or change your atmosphere. My attitude is quite desirable, turns out! Congratulations, Becci! It looks like you have chosen a good boss. Thank you for the article Mr. Collins. I am in a position currently where I absolutely LOVE my job, and LOVE my patients, but the supervisors and managers are so far removed from what we do, they are terrible. They allow workplace incivility to run array, while writing hard-working employees up for nonsense. I am resigning as soon as I find a different job. What is really baffling to me, is the most of the management truly believe they are great at what they do, they seem to validate one another’s poor decision making- completely unaware that most of them are quite terrible at what they do. J, what you describe is not unusual. The bad boss problem is at least two steps beyond you, maybe even farther. Good leadership starts at the top. If you can’t find a transfer to a good boss within your organization, your only two options are clear, stay and put up with your misery or leave. A boss and a leader are totally different. Where a boss will direct, a leader will pave the way. A boss believes the principles of the job do not apply to them. A leader embraces the principles and leads by example.